$5 FLAT RATE "NO RUSH" SHIPPING ON ALL LOWER U.S. (48). NO CODE NECESSARY !! If you choose any other method, we will assume you purposely chose that method for a reason, so it will stay that method and stay that price for that method. We reserve the right to choose whichever shipping method we prefer for your order (US Post Office, Fed Ex, UPS). Order must be continental U.S. (Excludes Hawaii and Alaska, Military APO/FPO and other US territories). Offer not valid on any international orders. Offer only valid for BARNETTHARLEY.COM website orders, excludes all 3rd party websites. For example eBay, Amazon, etc. Also not valid for any in store shipments. Shipping discount applies only to in-stock items. If your items are special order or must be specially shipped, these items will not be included in the promotion. Offer only good for Standard Ground shipping method (excludes, 3-day, 2 day, Overnight or Express delivery). Offer only valid on Motor-clothes and Collectibles only, excludes all others such as parts and motorcycles. Management reserves the right to deny shipping promotion and exclude over-sized items, heavy items, 2 part shipments, items not in stock, or any shipment that may have special shipping circumstances. If you have any question prior to ordering please call us at 1-800-796-8106. If we have an issue with your shipping for some reason, we will call you on the phone number you have on your account. All Qualifying $5 Flat Rate orders are shipped via Ground Shipping methods. All Qualifying $5 Flat Rate orders are shipped via Ground Shipping methods. Due to the nature of our order processing and amount of orders, we do require a minimum of 24-48 hours to process your order. Your order will not go out the same day you order it. For example, if you pick Overnight, 2-day, or 3-day shipping, that will not necessarily ship out that day. It will ship with an expedited method, AFTER we have processed and gathered your order. We try to process all orders as first-in-first-out, but we do try to process the expedited shipping orders first. We are not responsible for and are excused from delays due to events outside of our control, including but not limited to acts of God, weather-related delays, construction, and work stoppages. If we have an item out of stock, we reserve the right to adjust your order and issue a refund and ship your order AS-IS. We would like you to get the rest of your order as fast as possible. Any items removed from your order will be refunded and your shipping price may also be adjusted. No international (non U.S.), military, or territory orders can meet a deadline and are therefore excluded from any particular arrival dates. In addition, we may ask for extra identification to verify your charge account. If you order expedited shipping, especially if it is shipping to any address other than the billing address, we may ask for a scan/copy/fax of your ID and or back of your credit card. (explained further in see section "we may ask for additional information". Your order may not be processed or shipped until this information is verified. Not responding or providing verification information may result in a delay to your order. Barnett Harley-Davidson will not be responsible for any additional cost/shipping charges you may need to get it there on the day you request. * Please select "Military APO/FPO" shipping method during checkout. If for some reason the promo does not work for you during checkout and we catch that you do qualify, we will refund you the difference. All Qualifying "Free Shipping" orders are shipped via USPS Priority. Large shipments, 2 part shipments, overweight shipments may be excluded from the promotion. Due to the nature of military deliveries, we can not guarantee any certain delivery date. The USPS hands off all packages to the military post and they handle it from there, so the USPS won't even have up to the minute tracking until it is delivered. We do require a minimum of 24-48 hours to process your order. Your order will not go out the same day you order it. We are not responsible for and are excused from delays due to events outside of our control, including but not limited to acts of God, weather-related delays, construction, and work stoppages. If we have an item out of stock, we reserve the right to adjust your order and issue a refund and ship your order AS-IS. We would like you to get the rest of your order as fast as possible. Any items removed from your order will be refunded and your shipping price may also be adjusted if there is one. No international (non U.S.), military, or territory orders can meet a deadline and are therefore excluded from any particular arrival dates. In addition, we may ask for extra identification to verify your charge account. If you order expedited shipping, especially if it is shipping to any address other than the billing address, we may ask for a scan/copy/fax of your ID and or back of your credit card. (explained further in see section "we may ask for additional information". Your order may not be processed or shipped until this information is verified. Not responding or providing verification information may result in a delay to your order. Barnett Harley-Davidson will not be responsible for any additional cost/shipping charges you may need to get it there on the day you request. Offer only valid for BARNETTHARLEY.COM website orders, excludes all 3rd party websites. For example eBay, Amazon, etc. Phone orders will also be excluded. Offer also not valid for any in store shipments. You MUST place your order online through the website. Offer only valid for a SHIPPING ADDRESS with APO/FPO city in the address for the coupon code to be valid on your order. In order to qualify for the FREE SHIPPING on special 5 for $25 (or 2 for $5) items, a minimum of $25 must be purchased. Any orders not meeting this criteria will be canceled with or without notice. All other orders or regular sale items or full price items should qualify for the FREE SHIPPING. If you have any question prior to ordering please call us at 1-800-453-1513. For orders that qualify for free shipping, we will ship your package from whichever shipping carrier is most cost effective. This may include,but not limited to, USPS, UPS, or FedEx. If you are shipping to a PO BOX, we must ship it by United States Post Office. Or you can provide a physical address that UPS or FedEx can deliver to. Coupon applies only to in-stock items. If your items are special order or must be specially shipped, these items will not be included in the promotion. Offer excludes any previous orders. Offer only good for standard shipping method (excludes, 3-day, 2 day, Overnight or Express delivery). 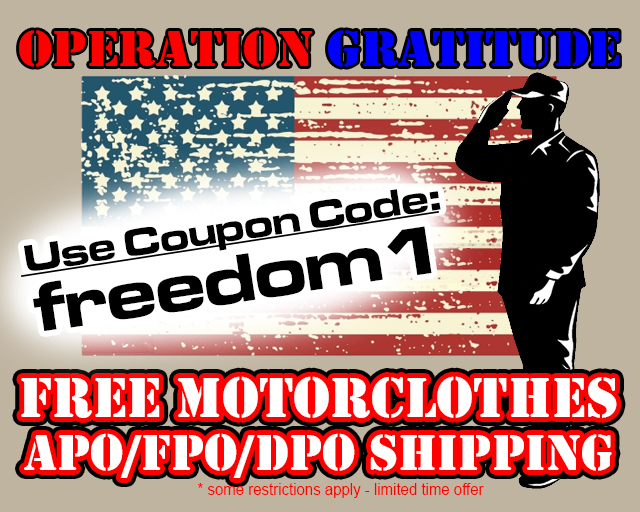 Offer only valid on MotorClothes and Collectibles only, excludes all others such as parts and motorcycles. Management reserves the right to deny shipping promotion and exclude over-sized items, heavy items, 2 part shipments, items not in stock, or any shipment that may have special shipping circumstances. We will call letting you know if this is the case. If you have any question prior to ordering please call us at 1-800-453-1513. Many online sites may claim to have BarnettHarley.com coupons or discounts, but we host and share our own coupons/discounts with everyone. The BarnettHarley.com experience is based on providing customer service with a large selection of Harley-Davidson® MotorClothes®, Collectibles, Riding Gear, and Accessories. You can also be officially notified of special offers by signing up for our weekly newsletter by clicking here. Barnett Harley-Davidson has partnered with a trusted third-party shipper to ship orders and handle payment information for our international customers. Simply put any items you wish to purchase in your shopping cart and choose the "International Checkout" option. You may pay with international credit cards, PayPal and bank wire transfers. Once your order is completed, all inquiries should be directed to the following: INTERNATIONAL ORDERS E-MAIL or (786) 314-7144. Please look for this icon on the left to know if your item is eligible for international shipping. Due to Harley-Davidson Motor Company policy changes, effective 8/1/11, numerous items are no longer eligible for sale or shipment to international destinations outside the U.S. Currently this includes, but not limited to, Genuine products from Harley-Davidson Motor Company. Harley-Davidson has limited our International selling to Licensed Products and Barnett Harley-Davidson Customized Dealer Exclusive items. Prohibited items can be identified by the designation, ***NOT ELIGIBLE FOR INTERNATIONAL SALE*** . Allowed items will be designated with the icon shown at the left (at the bottom of the Product Description field of each affected item). We do apologize in advance for the crude translations below. We do our best to identify all of the items that are covered by the policy, as well as the items exempt from the policy. In the event we fail to designate an item properly, please note that the result will be the same and is at our discretion to modify any order as necessary. The items will be cancelled from the order and only the allowed items will be shipped. We may try to contact you in the event this is necessary, but reserve the right to ship your order "AS-IS", without the restricted products and without notification. Placing any of these prohibited items in your shopping cart may result in a delay of the shipment of your order and all non-qualifying items will be cancelled without any notification, removed items will be refunded, shipping will be adjusted, and your order shipped incomplete. Your credit card is automatically charged for each item ordered, however, it usually takes longer for the bank to issue a credit back to your card than it does for them to charge it, therefore we will not be held responsible for any resulting delays in receiving credit back from your bank. Your shipping total may also be adjusted to reflect the new lower weight of your package. We try to ship everywhere in the world. However, some local and international post offices refuse certain shipments. Please check with your local post office for any importing/duty fees you may pay when receiving a package from us. If you refuse a shipment due to duty fees you do not want to pay and your package gets returned to us, you will not be reimbursed for shipping fees. Any final decision is based solely on the discretion of Barnett H-D management.